You will need to create an account with Unity to access the Unity Asset Store. You can download directly from the Asset Store and add to your list of available assets or in your open unity project. When you have an asset in your available list you will see an import button in the asset store tab within Unity instead of a download and then import. 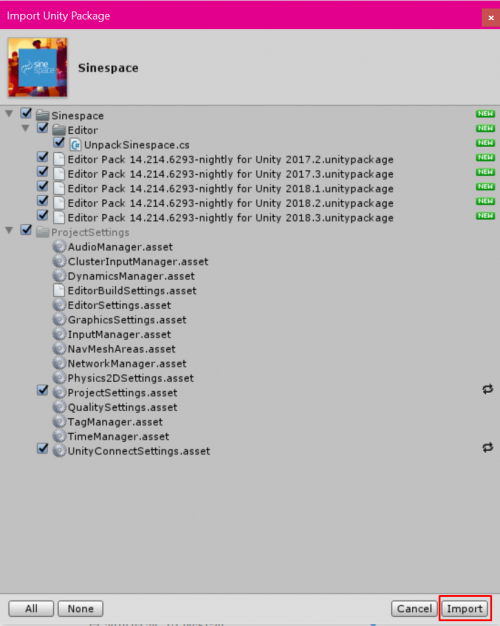 To download from your open Unity project, click on the Asset store tab, you will need to be logged into your Unity account, search for Sinespace and download the SDK package. Press the download button, when it has downloaded, click on the Import button. 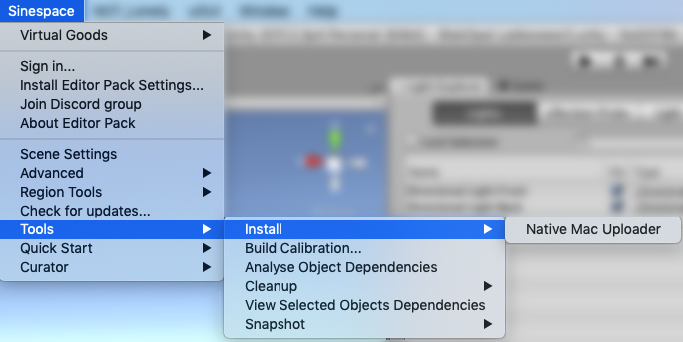 When the Import Unity Package window comes up, Leave everything ticked and click on the Import button. When it is ready to import it will ask if you want to install the Editor Pack. Click on the Install Editor pack button when it asks. Note: Unity may ask you to restart it a couple of times if you are using Unity version 2018.3. It will ask again to Import, click on the Import button. It will import all of the files needed. When it has imported fully, click on the Sinespace button at the top of Unity. Click on 'Install editor pack settings'. Once this is done, you can click on Sinespace again and click on 'Sign in'. Use the username and password you used to sign up for Sinespace creator here as this will allow you to upload your content to Sinespace. There a few different editor pack versions, and some work better with Unity versions than others. Please use the recommended package for your Unity version as show in the SDK package. Please do bear in mind that Unity version 2018.3 and the relevant editor pack are experimental. After the Editor Pack has been installed, you will either need to install the Native Mac Uploader (recommended) or the legacy mono framework version 4.8.0.382 (click here to download). Installing the Native Mac Uploader is easy, simply click on the SineSpace --> Tools --> Install --> Native Mac Uploader menu option. This process will take a little time, but should be completely automated and you will receive a message once the uploader has been successfully installed.